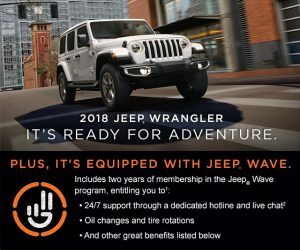 Just in time for summer, Jeep is introducing the Jeep Wave, as an incentive to purchasing the All-New 2018 Wrangler. Now is the right time to get into the All-New 2018 Jeep Wrangler. The Jeep Wrangler needs no introduction. The Wrangler has cultivated an exceptional reputation with its proven capability and stylish design. Ready for a test drive? Visit any of our four LaFontaine Chrysler Dodge Jeep RAM of Saline, Lansing, Fenton, and Clinton locations today.